Fr. Dr. K. M. George born in 1946 October 11. Now he is the Director of the Sopana Orthodox Academy in Kottayam, Kerala, India. After completing his college education in SB College Changanasserry and CMS College Kottayam, he studied theology at Orthodox Theological Seminary and Serampore University. He obtained a Master’s degree from Louvain and a Doctorate from Paris. He was Professor at the Bossuet Ecumenical Institute in Geneva and served as moderator WCC programme committee 1998-2006. He was also interested in painting and studied painting from the ‘Ecole de beaux arts’ fine arts school, Paris. Fr. Dr. K. M. George has in-depth knowledge in many languages-French, Syriac and Latin. His books in Malayalam and English are widely read, appreciated and recognized. An erudite scholar, thinker and writer, Dr. K.M.George has published a number of books and articles in English and Malayalam besides several speeches and presentations made in international forums. 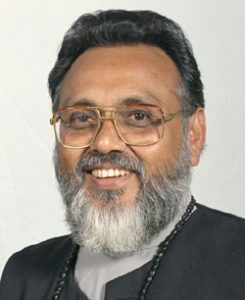 Some of his major works are: God-Language: A Patristic Perspective; Ethics of Just Peace-An Orthodox Perspective from an Asian Context; Gospel and Culture; Why Turn to East for Prayer; Wheel within a Wheel: An Eco-Irenic Understanding of God’s Earth; The Threat of HIV/AIDS: Some Theological Considerations; and Guru Gregorios; Irupatthonnam Noottandile Vichara Silppikal;Aadhunika Vichara Silppikal; Silent Roots; Pravaasathinte Naalukal; Janathayude Prakasam.